Situational awareness: Speaking at a steel mill in Granite City, Ill., President Trump predicted data today will show the U.S. economy is in "terrific" shape amid forecasts that growth topped 4% in the second quarter, the fastest since 2014, per Bloomberg. The 19% plunge reflects the fragility of the tech sector as a whole. And it's all the proof you need that tech investors have moved from greed to fear. "Fast-growing areas [include] the company’s cloud-computing business, advertising offerings and services it provides to sellers on its site." "[E]xecutives said heavy investments are paying off. Those businesses have helped offset its traditional retail business, which tends to yield lower margins although still the bulk of its revenue." The "second-quarter profit of $2.53 billion, up from $197 million a year earlier," makes "three straight quarters of profits over $1 billion, and extends Amazon’s profitability streak across three years." Why it matters: "No longer is Amazon known for suffering losses or producing razor-thin income by plowing every dollar it makes back into investments." Key stat: "Amazon ... is now estimated to draw roughly half of every dollar spent online in the U.S."
What's new: "Cohen alleges that he was present, along with several others, when Trump was informed of the Russians' offer by [Donald] Trump Jr."
"By Cohen's account, Trump approved going ahead with the meeting with the Russians." "Cohen is willing to make that assertion to special counsel Robert Mueller." Why it matters: "Cohen's claim would contradict repeated denials by Trump, Donald Trump Jr., their lawyers and other administration officials who have said that the President knew nothing about the Trump Tower meeting until he was approached about it by The New York Times in July 2017." "Trump said on July 12, 2017, that he 'only heard about it two or three days ago.'" 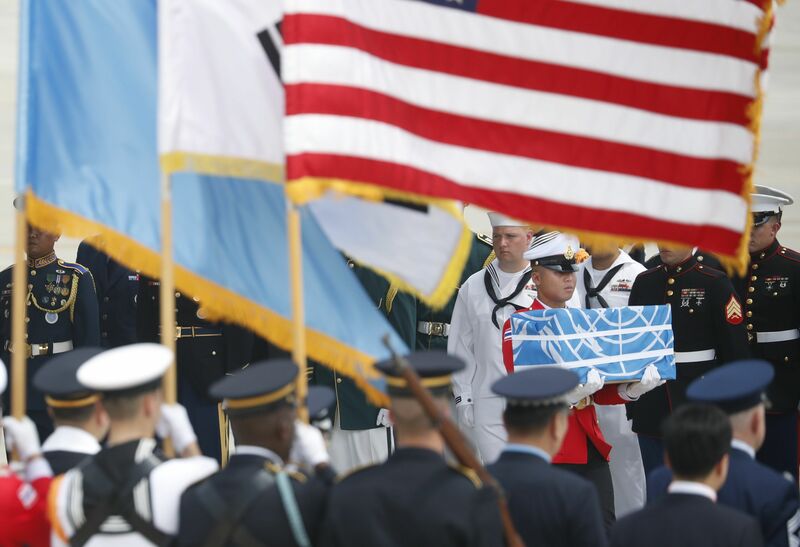 North Korea today "returned the remains of what are believed to be U.S. servicemen killed during the Korean War, the White House said, with a U.S military plane making a rare trip into North Korea to retrieve 55 cases of remains," per AP. The scene above is from "Osan Air Base in Pyeongtaek, near the South Korean capital of Seoul. A formal repatriation ceremony will be held there Wednesday." Axios and SurveyMonkey will be tracking five key voter groups through the Nov. 6 midterms and into President Trump's reelection race. Our opening data is a stark sign of the narrow path for the GOP in 2018 and for Trump in 2020. These swing voters (who supported both Barack Obama and Donald Trump) narrowly disapprove of Trump's performance, according in the Axios-SurveyMonkey poll. Nearly half strongly disapprove of Trump, but they're almost evenly divided between Democrats (44%) and Republicans (42%). They care a lot about health care and immigration — two of the biggest issues that are likely to drive Democrats to the polls. African-American women are often called the backbone of the Democratic Party, and not surprisingly, they overwhelmingly disapprove of Trump. Millennials (18-34) don't like Trump, and they are more likely to mention education and the environment over issues like health care and immigration. A court filing says the Trump administration has reunified 1,442 of the 2,551 migrant children between the ages of five and 17 who had been separated from their parents, Axios' Stef Kight reports. While some parents elected not to be reunited with their kids and were read their rights in a language that they understand, according to a Department of Homeland Security official, it's uncertain what will be done about other parents who have been deported. Go deeper: a detailed breakdown. 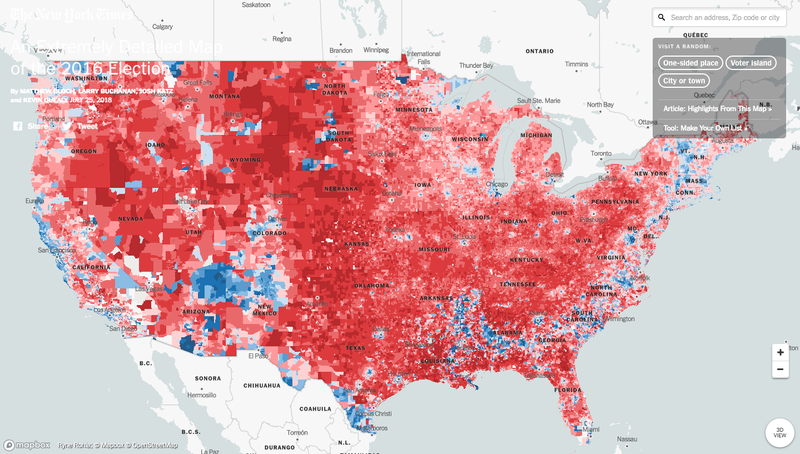 "An Extremely Detailed Map of the 2016 Election" ... The N.Y. Times posted a map that lets you explore the 2016 election by precincts — which may contain thousands of voters, or a handful. "Our previous election maps contained results for about 3,100 counties; here we show results for more than 168,000 voting precincts." Key stat, from a highlights page: "More than one in five voters lived in a precinct where 80 percent of the two-party vote went to Mr. Trump or Mrs. Clinton." Beijing has used U.S. tech to surveil its citizens, violate human rights and even modernize its military. Why it matters: Companies doing business in China often get caught in a web: Beijing uses its economic leverage to draw them in and then uses their technology for police-state tactics. As a result, "there are American companies enabling or complicit in major human rights abuses," says Elsa Kania, a technology and national security expert at the Center for a New American Security. Goop, Gwyneth Paltrow's lifestyle-and-wellness e-commerce business, was "named not just for her initials and for, you know, goop, but because someone along the way told her that all the successful internet companies had double O’s." "Goop is now worth $250 million, according to a source close to the company." Why it matters: "[P]eople were looking for leaders, and she was already committing public displays of ostentatious wellness: She showed up at a movie premiere with cupping marks on her back; she let bees sting her because I don’t know why. 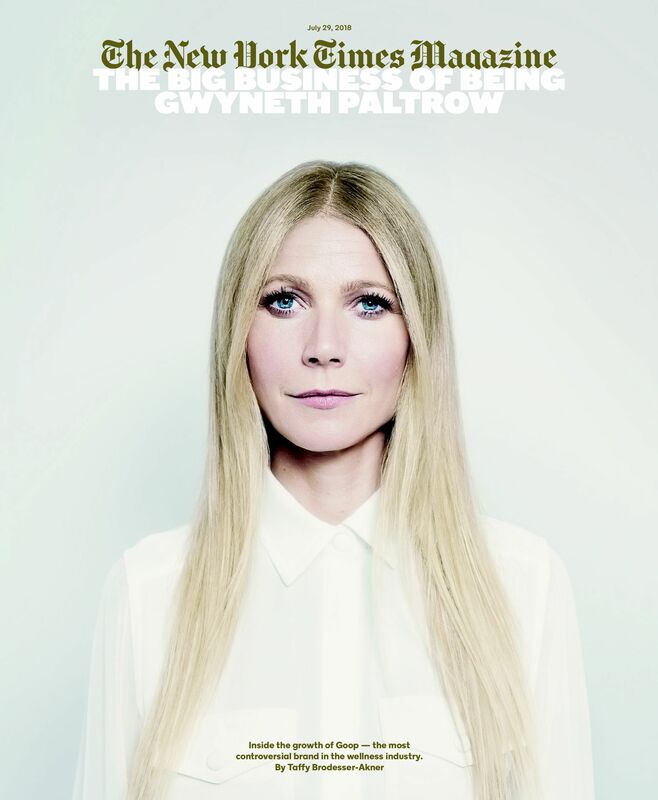 Suddenly Gwyneth Paltrow, the movie star, was a major player in an industry that was big business." Thanks for reading. Updates today and all weekend on Axios.com.